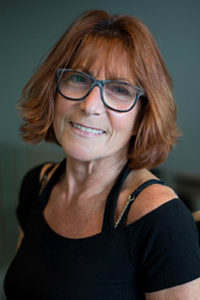 Claudia has been with Bronte Village Dental since 1991, creating and maintaining wonderful relationships with her patients while taking care of their oral hygiene needs. Claudia was born in Germany, went to school in the States, graduating from State University in New York with an associate degree in dental hygiene. 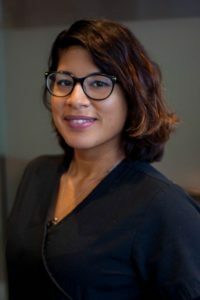 Claudia is very committed to staying current; she attends continuing education on a regular basis and is the recipient of the Hu Friedy Scaler Award for best clinical achievement. Claudia lives with her hubby and three children here in Oakville and in her spare time she is involved in several different types of fitness and loves singing. She sings with a variety of community groups. Tabesha is the newest addition to our dental hygiene team and has been in dentistry for a total of 11 years. 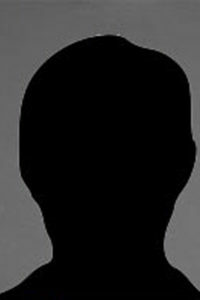 Originally, Tabesha was a chairside dental assistant. Her love of teeth and smiles, combined with her desire to help people and make them feel better, guided her into dental hygiene. 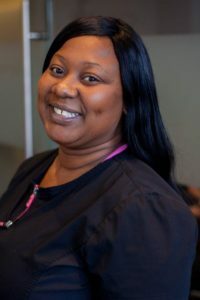 Tabesha really enjoys educating her patients on how they can maintain their beautiful, healthy smiles for life. Tabesha lives in Mississauga and is the mom of two growing boys. Her oldest boy is involved in competitive dance and he’s really good!. Tabesha loves spending time with her boys. She also enjoys dance and travel and she’s a great addition to our team. Originally from Iraq, Soline moved to Canada at the young age of 10 years old. Always smiling with her beautiful dazzling pearly whites, she was a natural to pursue dental hygiene. Soline attended Stafford College of Health Care, Business Technology for Dental Hygiene. Now she works hard to help all her patients achieve optimal oral health and maintain beautiful smiles for life. Her hobbies are painting, drawing and sketching and in her spare time, Soline enjoys traveling and going to museums. This is when she isn’t busy with her new husband, Andrew. 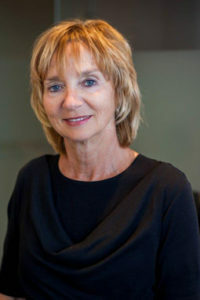 Debbi brings with her many years of experience in dentistry. She started in the clinical area of the dental office, then moved to reception, and on to teaching, facilitating workshops and consulting. She has joined the Bronte Village Dental team as Office Manager and is here to help our team and patients with any questions regarding treatment, insurance, financial arrangements, etc. Drop in or call with any concerns or queries! Debbi originates from Toronto and currently lives in Burlington with her husband, Bill. Whenever possible, they love entertaining friends and traveling. 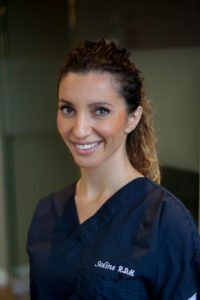 For those of you attending Bronte Village Dental for many years, Anna is a familiar face. Anna started her dental career as a dental assistant and, over the years, grew into the role of receptionist. Anna has been with Bronte Village Dental for even longer than Dr. Sarafov! She knows the practice so well that she’s indispensable to us all. She always has a smile and a kind word to greet you. When not at work, Anna loves traveling and spending time with her granddaughter.